LIC Varishtha Pension Bima Yojana is Pension Plan, which is helpful for the citizens aged 60 Years and above. Indian Government has announced to relaunch the Varishta Pension Bima Yojana under budget 2014-15. This is a single premium plan for single premium in which Life Assured can receive the pension in monthly/ Quarterly/ Half Yearly/ Yearly basis. The Unique Identification number for Varishtha Bima Yojana Policy is UIN: 512G291V01. This policy purely launched for the senior citizens of India in the year 2014. On the death of the pensioner, the purchase price will be refunded to the nominees/ legalN heirs. On Survival of the Pensioner, a pension in the form of an immediate annuity will be payable as per mode is chosen by the Pensioner. To buy this policy LIC Corporation has designed some eligibility Conditions and Criteria under this plan. LIC’s Varishtha Bima Pension Yojana Plan has some eligibility conditions regarding the entry age, sum assured, policy term, etc. Depending on the Mode of Pension LIC has decided minimum and Maximum Purchase Rates under this plan. The policyholder can visit the nearest LIC Branch Office to buy the Proposal form. Or you can go through the online to purchase the Policy. 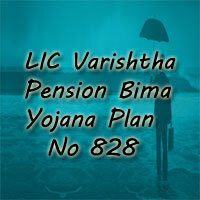 You can also get the LIC Varishtha Pension Bima Yojana 828 Plan through the Agent. Application form/ Proposal form along with a photo. Note: Proposal Form No 470 is eligible under this plan. Nominees can claim for the Varishtha Pension Plan after the death of the policyholder or after the successful completion of the premium. On the Death of the pensioner : If age not provided at the time of taking the policy age proof has to be submitted. NEFT mandate form for bank deposit. Bank Passbook or canceled cheque as a proof of Bank details and Proof of the death. Payment of Pension : Policy Holder Existence certificate to stop frauds. it will be given at the time of taking the policy. Proof medical treatment to self or spouse. NEFT mandate form for bank transfer. Bank Passbook or canceled cheque. Proof of age if age not admitted at the time of taking the policy. There is a Loan Facility is available under this plan. Loan facility is available after completion of 3 policy years. The maximum loan that can be granted shall be 75% of the Purchase Price. The policyholder has to pay the tax amount also while taking the policy. The amount of Tax paid shall not be considered for the calculation of benefits payable under the plan. If the Policyholder doesn’t pay the premium within the time, the company will extend the time to pay the premium is a grace period. LIC 828 Plan has the grace period of 30 days. Assured candidate can pay the premium within this Grace Period. If the Policyholder doesn’t pay the premium within the grace period, then the Policy will be the lapse. A lapsed Pension Plan will be revived within the two consecutive years from the date of first unpaid premium. This Pension plan will be revived before the expiry period of Policy term. The Policy can be surrendered after the completion of 15 years. Within 3 policy years would be 70% of the Single Premium Paid excluding taxes and extra premium, if any. For deferment period less than 10 years: The policy can be surrendered provided the premiums have been paid for at least two consecutive years. For deferment period 10 years or more: The policy can be surrendered provided the premiums have been paid for at least three consecutive years. The Guaranteed Surrender Value is a percentage of total premiums paid excluding taxes, extra premium. Suicide Clause: No Suicide Clause will be applicable under this policy. If you are not satisfied with the Terms and Conditions of the Policy, you can return the LIC 818 Varishtha Pension Bima Yojana Plan within the 15 days from the Date of receipt of the Policy. The amount of stamp duty will be 20 paise per Rs. 1000 of the total pension amount payable for a period of 12 years. Rebate: No Rebates are available under this plan. Reinsurance: There is no need of Reinsurance under this policy. Assignments and Nominations: No assignments are available under this plan. 1. Can I surrender my policy within the Policy Term? A. Yes, Surrender value is applicable on earlier termination of policy/ Contract. 2. Is there any loan benefits in this LIC 828 Plan? A: Yes, there is a loan facilities will be provided under this plan.